I had a meeting with one of the developers behind this brilliant social marketing tool. It’s called Sodash from an Artificial intelligence agency in Edinburgh called Winterwell Associates. It’s a tool that allows brands and businesses to monitor what’s being said about them online (so far so Google Alerts). This is where the clever bit starts. By creating a bespoke social dashboard (see where the name comes from?) of predetemined topics that the user wants to monitor and then marrying those topics to predetermined and tailored interventions the user can immediately respond when something is being discussed about their brand. 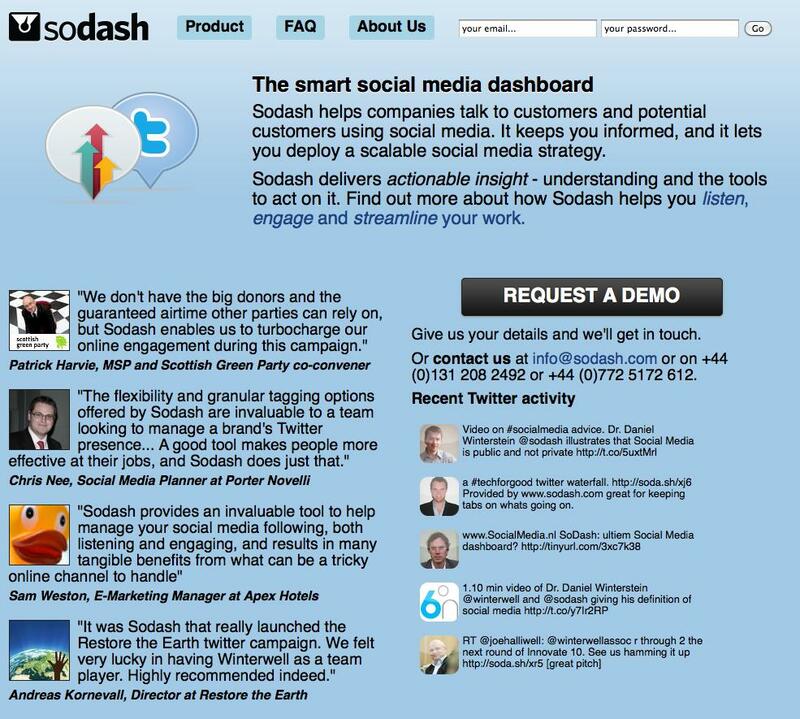 From a reputational management point of view Sodash can help users respond to criticism. Say you were RBS and someone facebooked that you were daylight robbers you could directly intervene in such a way that you might be able to limit the damage. I’ll leave it your imagination as to how you’d personally do that. On a more positive front, say you were a scarf manufacturer and someone Facebooked that they were freezing cold (using freezing cold as the trigger) you could intervene and offer them a 10% on your lovely range of scarves. I love it. I love the fact that suddenly social media monitoring has the opportunity to create a dialogue as opposed to just opening a window on the world. Now it’s a door, that opens both ways. For those of you who missed my earlier post about Twitter you might have missed the burgeoning debate. It really is getting quite heated. Do feel free to join in here. We’re up to 55 comments so far.